Land of Thunder Dragon, Bhutan is a mysterious country place. Bhutan is the first countries in the world to become carbon negative. Moreover, it is the last Himalayan kingdom, masked with mysteries and magic. Further, this country has carefully embraced Buddhist culture. Bhutan holds many surprises, a country where chili is the main dish and the rice is red. A country, where the protective penises are painted beside the walls of the buildings (also known as Phallus paintings). In Bhutan, Buddhist culture and tradition preservation go hand – to – hand with environmental protection. The Bhutanese pride themselves with sustainable tourism approach with a philosophy of Gross National Happiness (GNH). The foreigner has to pay a superior royalty for Bhutan tour packages. A tourist who wishes to book a Bhutan tour package must book all the service from the Bhutan travel agent. Further, Bhutan tour packages through a famous online travel agent will be a disaster. One question lingers among travelers. Why spend so much money to visit Bhutan? Bhutan is the last Shangri-la. It is still a secluded place. In addition, there are direct flights to Bhutan only from a few countries in the world. Furthermore, Bhutan has an amazing Himalayan landscape, where the highest peaks rise above the shadowy gorges. The majestic fortress-like Dzongs and monasteries supplement Bhutan’s beauty. This unique architecture can be seen nowhere in the world. Moreover, there are the textiles and handicrafts, outrageous archery competitions, high altitude trekking trails, and stunning flora and fauna. Most of the Dzongs and Gompas in Bhutan have annual festivals featuring mesmerizing ritual dances and dramas. The monks perform the dances to honor of Guru Rinpoche. As, per the legends, Guru Rinpoche flew back on the tigresses back to a site Taktsang Monastery to defeat the demons. After that, he meditated there for three months. This site is now one of the best tourist attractions in Bhutan. This site is popular among tourists as Taktsang Monastery also referred to as, “Tiger Nest Monastery”. Moreover, every Bhutan tour packages include Taktsang Monastery as a prime highlight. Most of the tourist attractions lie in western Bhutan. This is because of its excellent infrastructure, fantastic attractions, and spectacular festivals. Thimphu the capital of this mysterious country swells with tourist. Thimphu combines a natural small-town without traffic, crimson-robed monks. The government ministers clad in traditional dress and camera-wielding tourist. In addition, to the traditional Buddhist sights and attractions, it offers café, nightclub, and restaurant. Thimphu rises over its feet during the annual Dromchoe and Tsechu festivals. Tsechu festival falls on January – February. It is one of the most revered festivals of Bhutanese. Further, this festival lasts for four days. These are the times when tourist swells up Bhutan. Most tourists start their Bhutan tour packages start from Paro. This charming town lies on the bank of Paro (or Pa) Chhu. The main street colorfully lined up with painted wooden shops fronts and restaurants. The Paro valley extends west all the way to the Tibetan border. Consequently, en route, it passes through a dozen resorts, fantastic scenery, and Bhutan some famous attractions. Kyichu Lhakhang (one of Bhutan’s oldest and beautiful temples). There are also several options for the tourists’ interested hiking in Upper Paro Valley. One of the most interesting being an hour- long hiking along the forested hillside to Zuri Dzong. Hiking continues downwards to the gate of Uma Paro hotel. Cheli La Pass is the highest passable road in Bhutan. From Paro, it is 2.5 hours drive to the Haa Valley over the Cheli La Pass. This is one of a scenic drive in Bhutan. The drive will pass through Drub Chou with rock paintings of Guru Rinpoche and his two wives. The drive will pass through Cheli La, making it the highest paved road in the country. During October and November, which are the dry seasons the skies are clear. One can have a spectacular view of the Himalayan range and the stunning landscape. Interested tourist can take a hike up the mountain ridge (1.5 hrs walk) for a spectacular view of the mountain landscape and the Himalayan peaks. The scenery is simply stunning. After making 26 km descent from the pass to Haa valley, the golden roof of Haa Dzong becomes visible. This isolated Haa Valley lies southwest of the Paro valley hidden behind the ridge of Cheli La. 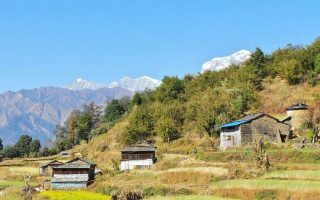 The valley is home of the Dorji family, which is a queen grandmother. The picturesque valley is popular for mountain biking through off the beaten track and hiking. This valley has at least half a dozen monasteries and is one of the scenic destinations in Bhutan. One of the best tourist attractions during the Bhutan tour is a visit to Punakha Valley. The Punakha district covers the vast area from the heights of Dochu – La mountain pass (3,100 meters) to the subtropical riverside of Punakha. Punakha lies in the fertile and beautiful valley right at the junction of the Mo Chhu (Mother River) and Phi Chuu (Father River). In the very junction sits one of the beautiful Dzong of the country, Punakha Dzong. This Dzong is the prime attraction in Punakha, this is perhaps Bhutan’s most impressive architecture. Punakha served as a Bhutan’s capital for 300 years. It is here, the first king of Bhutan was crowned. From the capital of Thimphu Punakha is 2.5 hours drive over the Dochu La mountain pass (3,100 meters). This is also one of the scenic drives in Bhutan. The drive starts from the capital and reaches the high altitude of Thimphu to the balmy, lush landscape of Punakha Valley. Further, the drive passes through Dochu La marked by the array of prayer flags and an impressive collection of 108 Chortens. Moreover, on a clear day, tourist will have a spectacular view of the Himalayas from the Pass. There are also popular hiking routes from Dochu La. The famous being hike to The Divide Madman monastery. Descending from Dochu La, the landscape changed and from the cool heights of the mountain, the drive will continue to sub-tropical Punakha Valley. The famous attractions in Punakha during Bhutan tour packages is Punakha Dzong, and yellow roofed Chimi Lhakhang. Many Bhutan tour package includes Punakha as a day tour. However, one night stay on Punakha is highly recommended. The scenic Wangdue is primed on the once magnificent Dzong. This place is a half hour drive from Punakha. As the drive continues tourist soon see the ruins of Wangdue Phodrang Dzong. This magnificent Dzong name stretches all the way to Pele La (3,423 meters) and Phobjikha Valley. The tourist attraction here centered at ruined Wangdue Phodrang Dzong. Further, the spectacular scenery is the highlight of this destination in Bhutan. As a result, of isolation from many countries, until date, Bhutan remains a secluded destination. It is one of the beautiful destinations and the huge royalty is totally worth it. Bhutan is regularly conscious about the environment and tradition protection. There is nowhere in the world where tradition and environmental protection is the top priority of the country. Bhutan tour packages should be on the top of the travel list.